This question has come up a number of times: "Does a rear spoiler lower my mileage?" Also consider that while some OEM & aftermarket wings & spoilers improve high speed stability, the type of person who is going to remove a spoiler to increase efficiency probably doesn't drive at speeds where reducing rear lift is an issue. The Renault Logan Eco2 sported a deck lip extension and other mods to increase FE. 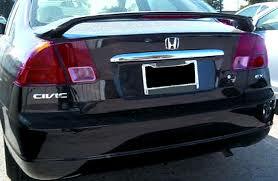 Honda Civic Hybrid has a rear spoiler not found on the non-hybrid version. 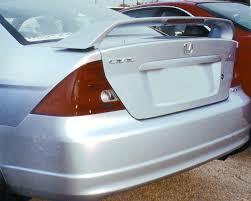 Is it reasonable to say that spoilers (wings) that stand off the rear deck should be deleted for better mileage? Or do we need to say that every model is different, and the only surefire way to know is tuft test, tuft test, tuft test. I would think a basic coast down test of some sort would work. Find a flat spot, get the car up to 80mph and let it coast in N measure the time from 75mph to 50mph. Do it enough to get a good average and consistent numbers then remove the spoiler and do the same run again. Some variation of this would probably be easy for most people to test. I don't think saying always remove it is better though. Remember when I did a coast down test with my rear spoiler a while ago and it was actually better with the spoiler on It was a tiny difference but it was repeatable so it had to actually be helping. That's what I meant to say: coastdown test, coastdown test, coastdown test. Coastdowns: They keep beer cans from making rings on the furniture, right? Last edited by Silveredwings; 01-10-2008 at 12:04 AM.. I thought that's what all those old America Online CD's that came in the mail were for. This is a great question, and one I've been asking myself lately WRT the Paseo. Now, the Paseo's spoiler doesn't look like much. There is barely a gap between the trunk and the bottom of the spoiler (less than an inch). 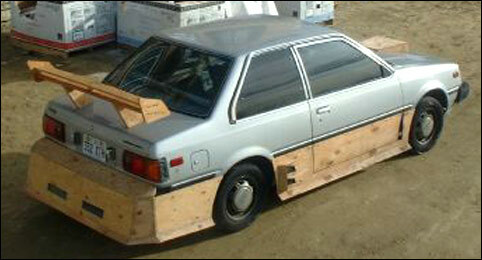 This leads me to believe it may help with aero. Also, I have noticed that on a rainy day the back windshield stays completely dry at highway speeds. I believe this is a good thing? None of my other cars stay as dry as the Paseo in rain. So, is it possible that the spoiler helps this (since it is downstream of the airflow)? I think I speak for most here in saying I don't want to rip off the spoiler (a big PITA from what I've heard) just to see that it does in fact help aero. Last edited by Daox; 01-15-2008 at 01:11 PM..
MetroMPG, I just gotta ask...where did you get that photo of the blue Nissan with the plywood skirts and rear wing? Is there a "story" that goes with that photo?